Kebayoran Lama Urban Village, South Jakarta, deploy 50 personnel combined with Satpol PP from sub-district and urban village and TNI/Polri to control 10 illegal street vendor booths at Jl. Pinang 6, RW 02, Pondok Pinang. "These illegal building and booth were placed in Phb Kali Bogor riverbank "
It went well without any resistance from booth owners which everyday selling food and beverages, and also second-hand goods. 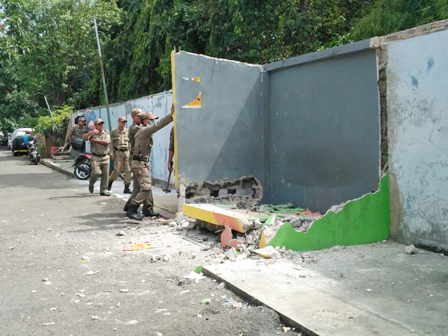 Beside of illegal PKL's booth, personnel also demolished 10 semi-permanent building in Connecting Channel (Phb) of Kali Grogol's riverbank. Kebayoran Lama Urban Village's Head, Sayid Ali said that, his side warned them and asked PKL and illegal building's owner to disassemble by themselves but they did not care.
" These illegal building and booth were placed in Phb Kali Bogor riverbank . If we don't demolish it, it will cause slums and mess. We already warned the owners but they didn't concern it," said Sayid, Wednesday (1/18). Personnel used hammer to break those illegal semi-permanent building. While, ruined illegal booths were transported by truck. "We will assign Satpol PP to guard this location so they can't do some activities again," he closed.